In 2013, Mark Warr found himself overweight, suffering from arthritis in his knees, and being forced to use a walker to get around. To treat the arthritis Resurgens Orthopaedics recommended dual knee replacement but the surgery wasn’t going to be successful unless Mark lost weight. Over the course of the next year Mark lost an amazing 75 pounds and returned to Resurgens to have his knees replaced; his left knee in October 2014 and his right knee in April of 2015. After his first knee surgery and rehabilitation, Mark was able to walk without crutches and felt better than before the surgery. That was the moment he knew things could be better. After both successful surgeries Mark was sent to the Resurgens Rehabilitation clinic in Austell, where our team helped him over the final hurdle. 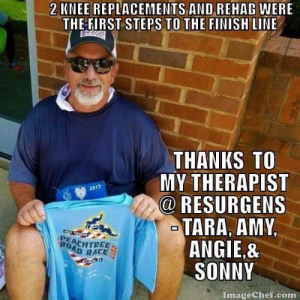 With healthy strong knees Mark began working towards his goal of completing the Peachtree Road Race. His training began with walking and biking short distances, slowly increasing the distance each week eventually up to five miles. When he hit this benchmark, Mark felt like he was finally ready to take on the race. But the Peachtree Road Race isn’t just five miles; it’s two miles to get to the staging area, six miles of the actual race, and then two miles back to your car. Yet at the completion of the race, Mark didn’t feel good – he felt great! Mark and his wife are now planning for a retirement they didn’t think was possible a few years ago. In 2013, Mark Warr found himself overweight, suffering from arthritis in his knees, and being forced to use a walker to get around. The retirement he and his wife envisioned wasn't possible. But after two successful knee replacement Mark and his wife are looking forward to seeing and hiking all over the world!